The RMS Titanic sank on April 14, 1912, only four days into its maiden voyage. More than 100 years later people are still curious about everything Titanic. And, it is not only how such an appalling accident could have happened, but also what life was like aboard the ship, including what the passengers ate. There were three classes of travel aboard: first, second, and third class, also known as steerage. The cost of traveling varied. A first-class ticket averaged about $150 (but went as high as $4,000—the equivalent of about $70,000 in modern day accounting). Second class cost about $60 and third was between $15 and $40. It is no wonder that the standards for each class were so varied. There were 2,229 passengers and crew on board when the ship set sail from England. There were menus of varying styles of food, and the provisions required for the voyage were enormous. There were thousands of pounds of meat, vegetables, fruit, and flour, thousands of bottles of alcohol, and 14,000 gallons of fresh water were needed for a trip that should have arrived in New York in seven days. Despite the Titanic being a British ship, foods served in first-class had more of a continental flavor as was the fashion for food at the time. In the second class and steerage, foods would have been less pretentious and more like the simple British and Irish food served at home. Three classes of travel on the Titanic meant three different menus had to be served daily. Passengers in first class were by far the best fed—they received the most sophisticated dishes served in formal settings. They had paid handsomely for this privilege with their ticket costing (in some cases) eight times more than second and 25 times more than third. As was the fashion in upper-class circles in Victorian times, the food was predominantly French in style, but some of the great British stalwarts like roast sirloin beef were placed on the menu. There was an abundance of choice at breakfast, and at dinner, there were as many as 10 courses served. Food was closer to home in second class. French menu selections rarely appeared on the menu, since traditional British food was preferred anyway. Curried chicken, baked fish, spring lamb, mutton, and roast turkey were common menu items, as was pudding for dessert. The night the Titanic sank, the doomed second class passengers had plum pudding, also known as Christmas pudding. Food served to passengers in third class was a scaled down version of what was made for second class. Passengers in steerage had little to complain about, as for many, this food was better than what they had been used to. One thing that was quite different was that third class passengers were not served dinner, but instead would partake in high tea, a custom that still exists today. Tea, as it is known colloquially, would always include a hot course requiring a knife and fork. For example, Irish stew was mentioned frequently on the menu. There are no surviving menus from third class on the night the Titanic sank, so it is not clear what those passengers ate that fateful evening. 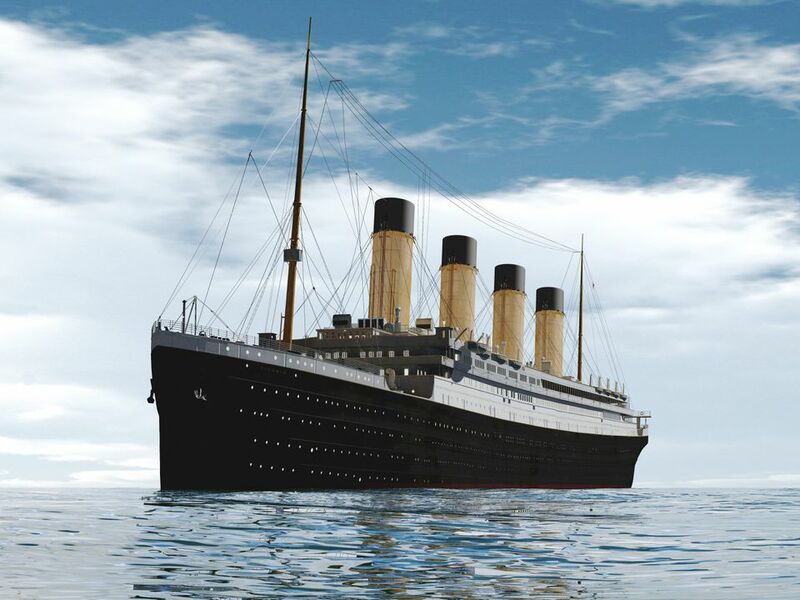 The RMS Titanic collided with the fateful iceberg at 11:40 p.m., long after dinner had been served. From salvaged artifacts from the sunken ship and company records, many menus were found giving a clear picture of what had been served on the ship. This following menu is from the evening of April 14, which for almost half of the first-class passengers, was their last meal.